This update’s layouts run the gamut from a micro that got just a little bit bigger to a “frozen” pizza. Thanks to all who have submitted updates! 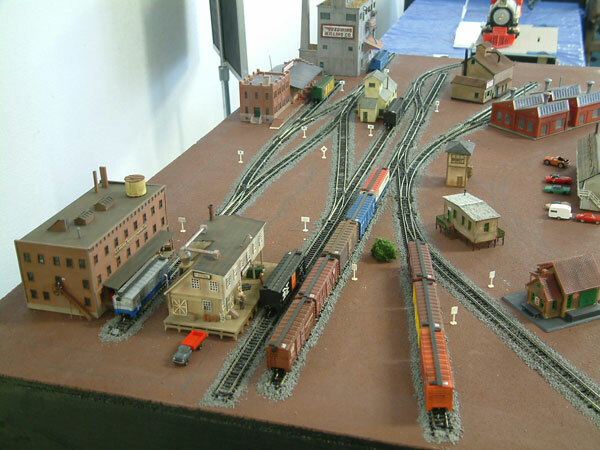 Max Sarazin‘s first version of his current layout was a small N scale at 2′ x 4’, built over 40 years ago. Well, when Max, who hails from Eastham, MA, USA, decided to rebuild in 2011, he did so in G scale, taking the layout a bit out of the micro category! His Weona Railroad (We-Own-a-Railroad), now at 12′ x 24′, has gone thru various interations, to the current plan you see pictured here. Max hopes to send some photos soon! 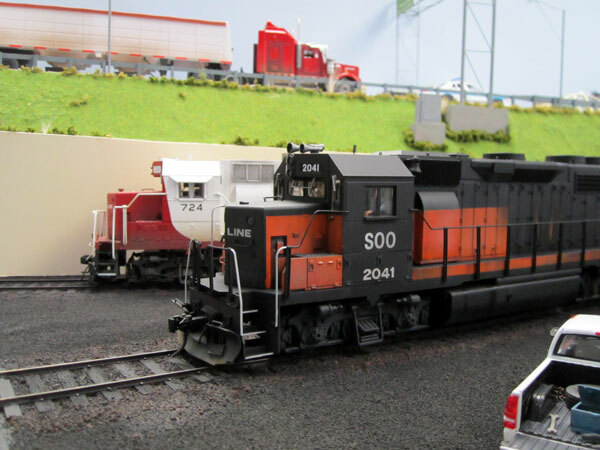 When Dwight Sedgwick of North Ft. Myers, FL, USA, saw Gary Miller’s combination Inglenook/Time Saver layout in our November 2011 update, he wanted to share what his club, Scale Rails of Southwest Florida ( www.scalerails.org ), built. 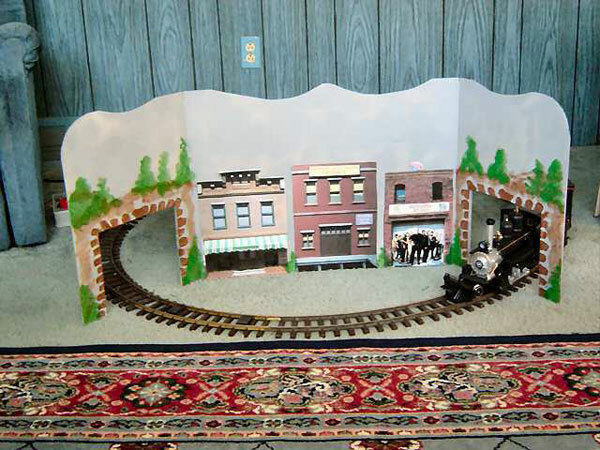 In Dwight’s words: “It is a similar layout and we incorporated it into our N-Trak layout. Since we use DCC, we are able to operate both puzzles at the same time. “Looking from the top the Inglenook uses the top three tracks on the right, the two top tracks on the left are for locomotive storage, the Time Saver uses the bottom section and there is a connector track to our N-Trak modules on the middle left. “The photo at top right shows the Time Saver on the left using the four industries plus the freight station as car locations. We chose industries that could all utilize a box car so they all made sense in receiving a shipment. On the right, the Inglenook utilizes the three tracks plus the lead that dead ends. The two tracks to the back right are for locomotive service, the middle track leaving the module connects to our N-Trak layout, and we added a rooming house, tower, general store, and yard office for scenery. Michael Buehrer from Schaffhausen, Switzerland, sends us information on a micro he built as a christmas gift for his twin-girls “(and also for me…)”, he says. 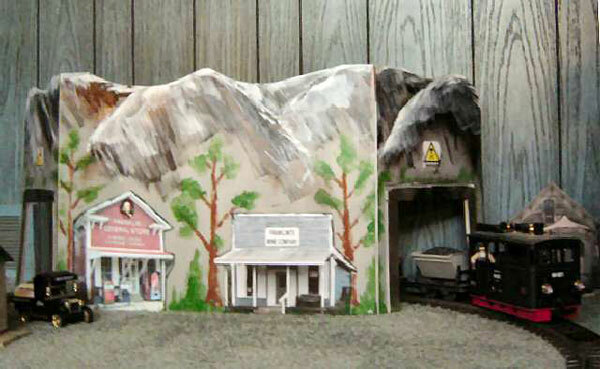 Michael writes, “I built a foldable N-scale Timesaver for playing with trains and to wake an interest for model trains. “The Timesaver measures 95cm x 23cm (37.5” x 9”). On the underside of one end there is a cover plate which is removable holding a space for the controller and the rolling stock. At the underside of the second half of the layout there is a rechargable battery from a RC-Shop, a On-Off switch and a connector to the throttle. On the trottle there is only a 2-pole wwitch On-Off-On to change direction and to stop the locomotive. 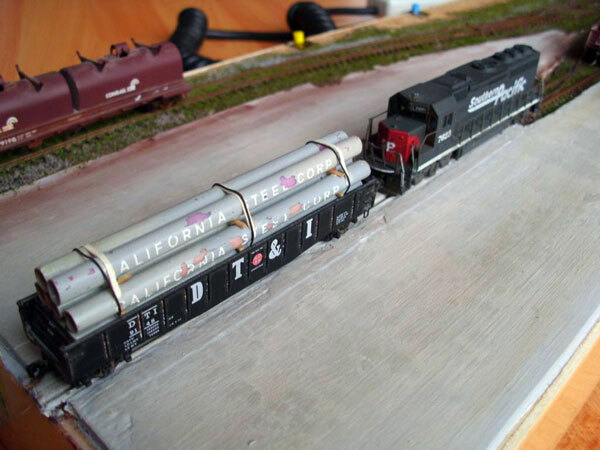 “Motive power is a Southern Pacific GP40-2, the rolling stock is a couple of 50′ cars for switching. A U.S. INSPIRED MICRO FROM THE U.K.
Jordan Foster, from Cradley Heath, West Midlands, UK, sent some photos of his micro called Schiller Point. 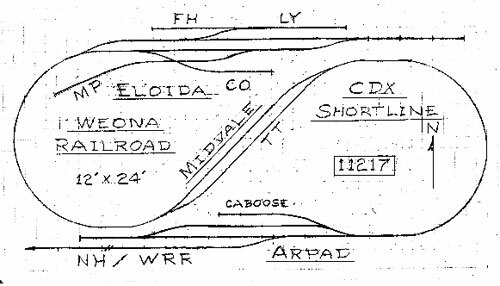 According to Jordan, “Schiller Point is an fictitious loco stabling point, but imagined to be located in a real area between the tracks and Interstate 294 just north of the real Schiller Park Yard, which was once the Soo Line’s main classification yard in Chicago, IL. “The layout is four feet wide at the ‘viewing’ end, and four feet deep, but narrows to one foot wide at the rear, with two simple hidden sidings beyond the overpass (Interstate 294). This is a bit larger than a ‘true’ micro layout, but it is still a rather small space for standard gauge O Scale—US outline at that!! “The ‘head-on’ viewing angle is something a bit different from the normal view of model railway layouts, and was inspired by a small UK-outline 4mm scale layout called Villiers Street that had a similar arrangement. Operations consist mainly of loco movements to and from the stabling sidings. On the short ‘main line’ to the right, various moves can be made, such as a switcher and freight cars shuffling up and down, as if a train is being marshalled ‘beyond the bridge’. Jordan recently exhibited Schiller Point at the 2nd annual Trent Valley North American Modellers Show in the West Midlands, UK in June 201, and notes that it was very well received! Frank Combe of Paris, France, emailed about a small locomotive project he built and named in honor of Carl. 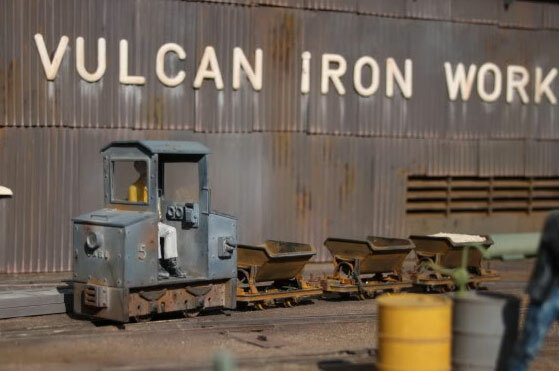 The small engine, built before Carl passed, is, of course, named “Carl”, and serves on Frank’s Vulcan Iron Works layout, among a plethora of unique motive power. To see more of Frank’s work, click here. A TRIBUTE OF SORTS… ON TOUR! Gavin Sowry, from Wellington, NZ, alerted us to developing story about a Gn15 wagon Carl built might be doing a world tour. 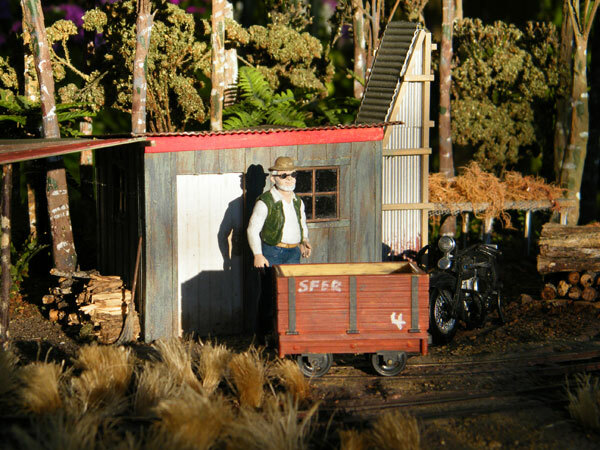 Word has it that Gavin and his friend Ben Calcott are working on a plan to have the wagon— featured here on Paul Napier’s Silver Pine Tramway (now owned by Gavin)—photographed on as many Gn15 layouts as possible. The tour photos, when completed, will be collected into one album. If you are interested in participating, or just want to see how things progress, head over to the Gnatterbox forum thread here. WINTER WEATHER BLUES? NOT FOR THIS MODELER! 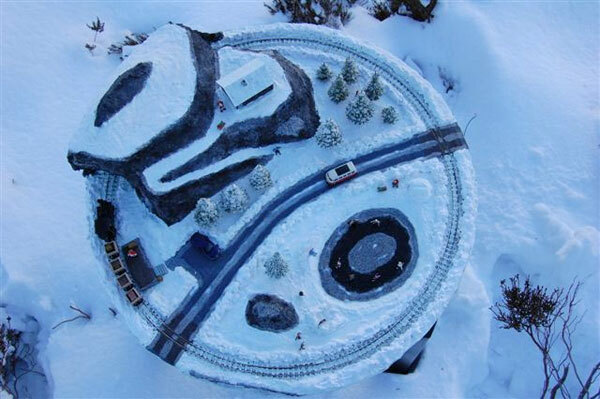 James Willmus of Hot Springs, SD, USA, takes inspiration from the cold weather for the creation of his new micro layout. 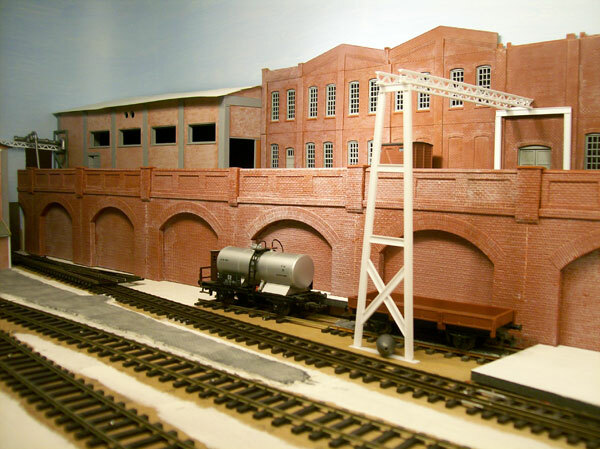 From James: “When winter comes, many modelers go into their basements or attics to run summertime layouts. Maybe it gives them a warm feeling to think about summer, but not me. When winter comes, I welcome it, and my layouts reflect that. For winter and the upcoming holidays, I thought it would be fun to create a micro layout. I call it, the Holly Jolly Lumber Co, or HJL. 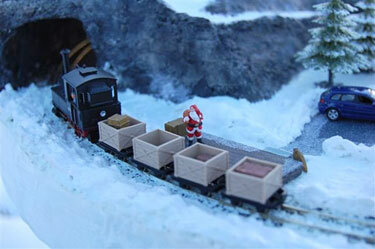 “The layout is Gn15, with a winter time logging theme. 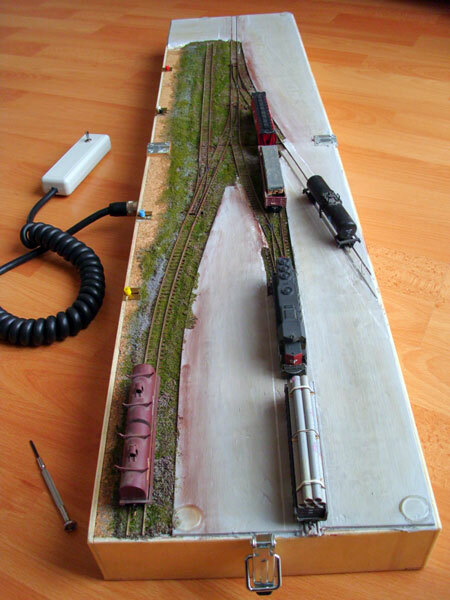 I don’t know of any 15-inch gauge logging railroads, but hey, it still looks cool! The great part about the design is 1). I can take the layout in the car and it only takes up ⅔ of the back seat. And 2). 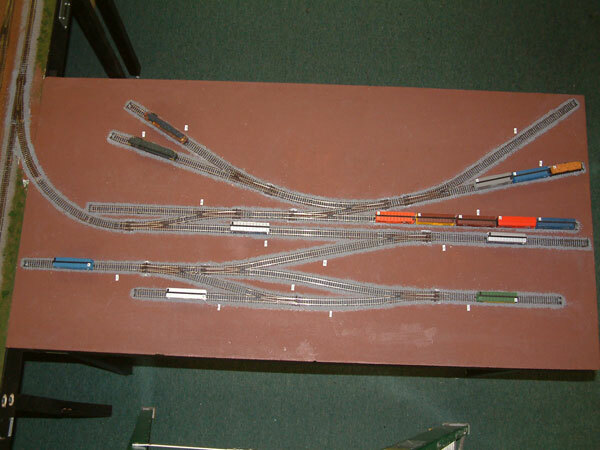 The layout can be operated two different ways: as a point-to-point system, or as two separate tuning fork layouts. “The inspiration of the design was from several layouts on this site, most notably Foldingham by Giles Barnabe (found here). The main differences in design is that there are only two switches instead of four, and the layout doesn’t fold, it just separates in to two pieces. Overall, the layout is 5.5” by 60”, making it only about 2.3 square feet! FRENCH MULTI-GAUGE LAYOUT GOES FROM 3 TO 4! “The first photo shows the new siding, added as an afterthought to enhance shunting possibilities. 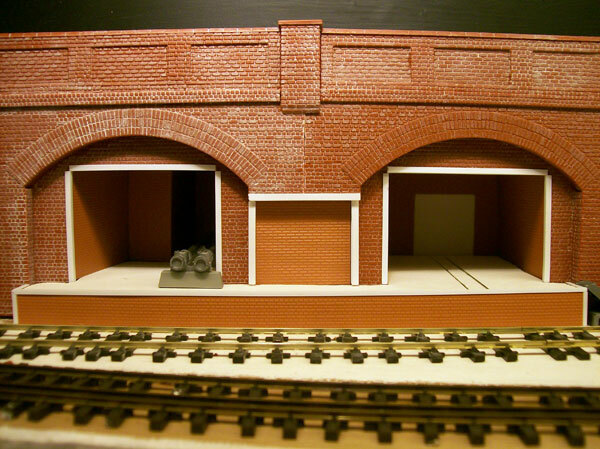 Brick archways next to wagons to be opened up. Also shows the gantry crane under construction to enable transfer of supplies from the standard gauge to the upper-level narrow gauge leading to the mine. “The close up of new siding showing how the two brick arches have been opened up for delivery of supplies (liquid, to the left, solid to the right) to the factory. Note the 6mm gauge track embedded in platform for moving heavy equipment, making the layout into a four-gauge one (H0, H0m, H0e, H0n). “I call it Town & Country, a dual-sided backdrop with Jersey City on one side, and Franklin Mine on the other. Both names are found in the Garden State of New Jersey where we reside. “It is made of corrugated plastic board (available in sign making shops) with pictures from the Internet pasted on it. The folding sides are held on with plastic mailing tape. The painting of the mountains were done thanks to watching clips on YouTube of that guy with the big bushy hair who teaches how to paint. He was frequently seen on PBS, as you may recall. 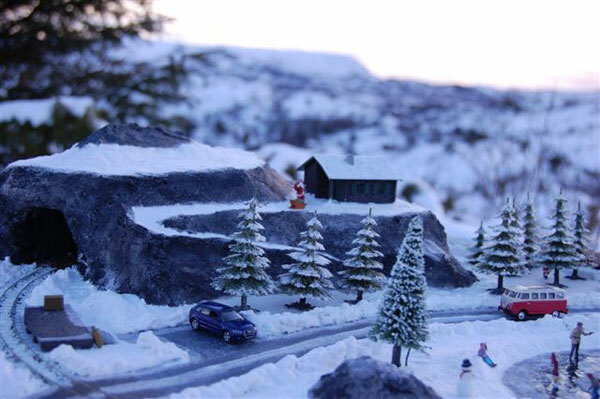 This small H0e layout, submitted by Ole Palerud of Knarrevik, Norway, is called Frozen Pizza and is a father’s contribution to a Christmas decoration. From Ole: “The picture is taken in what we in Norway call “the blue hour” just before the sunset. Ole says the layout was built to fill a need for more layouts for an upcoming model railway exhibition in Bergen, Norway that he heads up. Hopefully this won’t be the last one we see from Ole!